Purdue’s Bryan Pijanowski, Professor of Landscape Ecology, has visited Costa Rica several times in the past decade. For more than 15 years, he’s been making audio recordings – or Soundscapes – of the environmental noises produced in the rainforest. What he’s discovered about the habitat has him greatly concerned. In 2010, he said the forest was loud and many frogs were visible. But by 2011 it seemed much quieter, and by 2015, the lack of sounds was alarming. 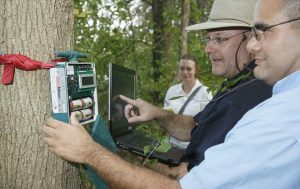 Pijanowski has set up as many as 34 high-tech microphones throughout the forest during his studies to test for sounds that may indicate extinction. He’s listening for the pulse of nature, particularly the sounds of amphibians and insects. The louder the sounds are in the forest, the greater the indication of a healthy ecosystem. A lack of sound, however, suggests what some biologists are calling the Sixth Era of Extinction, in which as much as 75 percent of all species could disappear during the next few centuries if efforts aren’t made to curb the changes. The International Union for Conservation of Nature says more than 40 percent of amphibians are at a high risk of extinction now. Frog extinctions have occurred worldwide in the past few decades due to habitat loss, climate change, and a dangerous fungus spread by humans called chytrid. Pijanowski in forest using technology to collect audio samples. Finding these endangered frogs has become increasingly challenging. Pijanowski has installed microphones on the forest floor and in the canopy to listen for sound changes that may indicate the location of species. His recordings, which date back to 2008, suggest substantial change. Pijanowski applies computer algorithms to study sounds and identify trends using audio files called spectrograms. A healthy ecosystem should have a full range of sounds in a spectrogram. By comparing one spectrogram against another, Pijanowski can identify sound gaps to indicate species that are missing. He has more than 255,000 recordings equally nearly 7 years of files. Pijanowski believes not enough data is available yet to make scientific conclusions, but the trends are concerning. He believes the recordings may become “acoustic fossils” of animals that are on the verge of extinction. The audio files ultimately may be the only record of their existence. The elimination of species could result in ecosystem collapse. Learn more about Professor Pijanowski and his research.